I wrote a quick downloadable PDF version of this tutorial on how I add beads to my torchon lace as I realised that I seem to be the only one doing it with these tools. 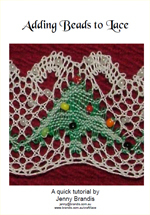 The pattern I was working on is one designed by Pat Milne and published in the Australian Lace magazine in 1999. 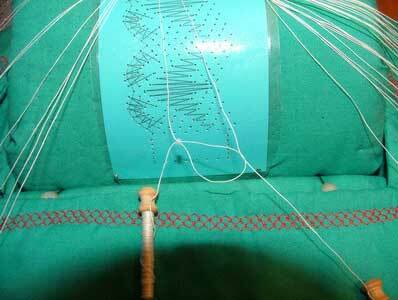 There seems to be two main schools of thought with regards adding beads to torchon lace. 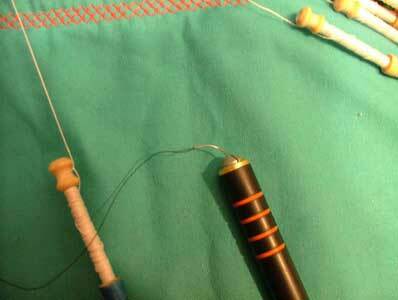 Threading the beads onto the thread before winding the thread onto the bobbin. 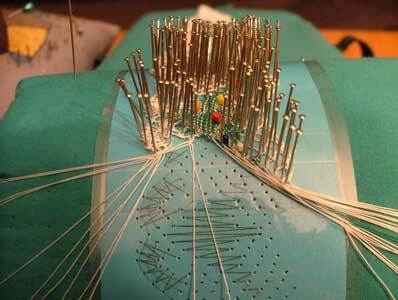 Pushing the bead into place as required. 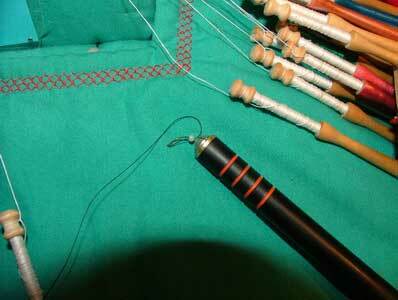 Using a fine crochet hook through the centre of the bead, hooking the thread back through before making a loop which you pass the second bobbin through (similar to a sewing). I have tried both of these techniques and was not happy with either. 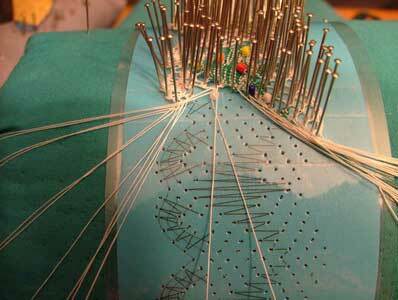 Adding the beads to the thread on the bobbin made it bulky on the bobbin neck and you will need to know in advance what colour bead sequence you are going to use. My fine crochet hook was too straight for my liking and the whole technique felt too cumbersome with the hook often catching only some of the thread, weakening it. To my surprise by changing the tools I use I have found that the second technique works best for me. 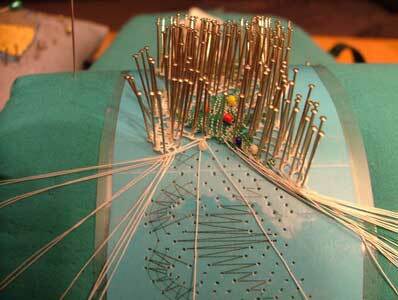 I use a pre-threaded suture needle from the chemist shop in a long handled pin vice I already had. 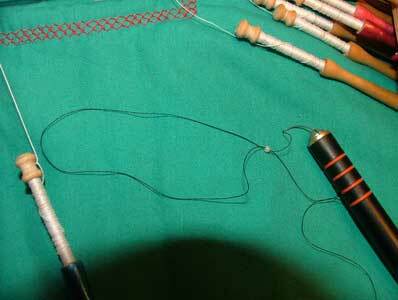 It gives me a nice degree of flexibilty as the needle is a curved 16mm one with 45cm of silk thread permanently attached. 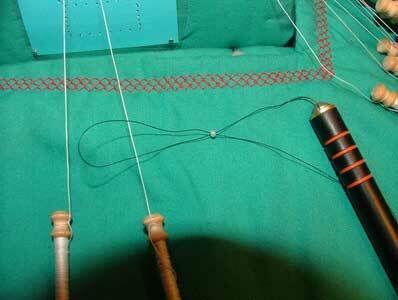 The length of the handle allows me to see what I am doing and the silk thread allows me to work the bobbin like a sewing. The next thing I have to say is please forgive the poor photography. 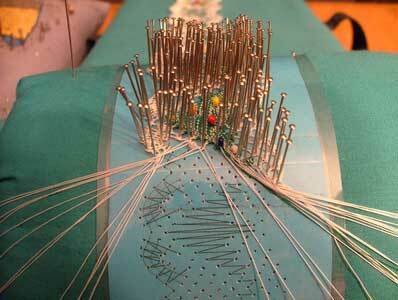 continue to lace as normal until you want to add the next bead.